Joyful songs or 'carols' are an integral part of many Christmas celebrations. 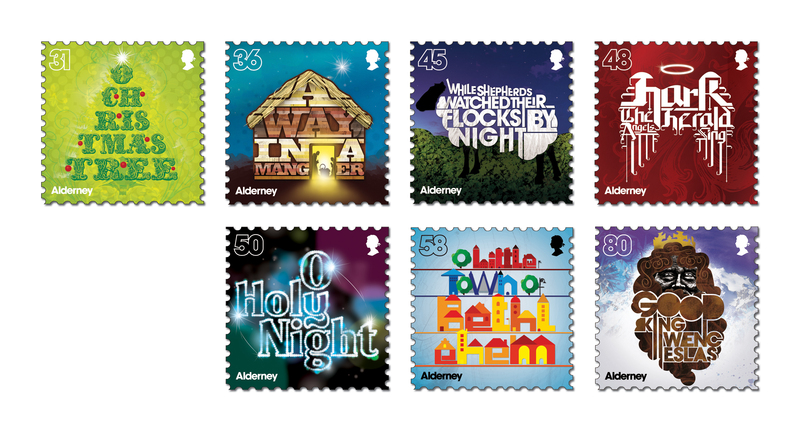 This year for the first time we have put together a very special issue of Alderney Christmas stamps the theme of which is 'Christmas Carols'. Our Alderney Christmas issue features a selection of seven carols; here we take a look at the history behind each one. Adorning our 31p stamp is a beautiful bright green Christmas tree. 'O Christmas Tree' originally named 'O Tannenbaum' is a German carol paying tribute to the beauty of the fir tree. A light emanating from the stable in which Christ was born is depicted on our 36p stamp illustrating the carol 'Away in a Manger.' This song was first published within a Lutheran Sunday school book in 1885; the music however was composed by William J. Kirkpatrick a decade later. A humorous interpretation of the carol entitled 'While Shepherds Watched Their Flocks by Night' is shown on our 45p stamp. Interestingly until 1782, this was the only Christmas carol officially sanctioned by the Church of England. 'Hark the Herald Angels Sing' is the carol shown on our 48p stamp, the author of this famous song was Charles Wesley, brother of John Wesley the founder of the Methodist church. A colourful representation of Bethlehem appears on our 58p stamp to illustrate the famous carol 'O Little Town of Bethlehem' which was written by American clergyman, Philips Brooks following a visit to the town. A mighty 'Good King Wenceslas' appears on our 80p stamp, the final in this issue. This carol emphasizes the virtues of generosity and kindness and is a Christmas favourite even though its lyrics refer to St. Stephen's Day or Boxing Day. We hope you enjoy this very special Christmas issue and we wish you a very Merry Christmas.